Don’t believe that your home can’t look fabulous in the winter! If you plan to sell your home in the winter there are many things you can do to give it great curb appeal. Curb appeal is important in any season. The winter is an opportunity to make your home stand out. Many seller’s won’t give the winter exterior the attention it deserves. This will give you the competitive edge. Take the focus off the dormant gardens, stop focusing on what doesn’t look it’s best and redirect the focus on what looks great. Here is a list of ideas to get you started. Turn on all the lights – remember that it gets dark very early so consider putting them on a timer. This is not just for showings. Many people will be driving by your home to see it from the outside prior to requesting an appointment. Yes…. all of them. It will look beautiful from the street, cozy and inviting. Make sure that what you see through the windows looks good as well. You may need to move a few things around. Windows – Have them cleaned and remove the screens if possible. They should sparkle when the lights are on as it gets dark and reflect the natural light and sunshine during the day. Color – Consider pops of color. Possibilities are painting the front door, decorating the door, mailbox, and planters and window boxes with evergreens. 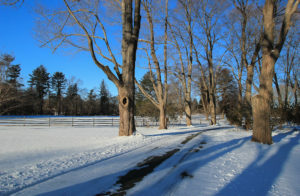 Snow – The walkways and driveways need to be shoveled. If you have a short walkway consider keeping the edging neat. Keep in mind how it will look as the snow melts. Sweep up the salt and sand. In addition to keeping the walk ways safe, your home should also look approachable. Pet Waste – Make sure the snow stays clean and the yard is also cleaned regularly throughout the winter. People will still want to walk around in the yard. Decks and patios – Try to keep them clear and looking great so people will know they are there and can easily step outside. Photos – Keep them updated. When there is snow outside it is great to have beautiful snow photos. After it snows have them taken right away before the snow looks messy. As the snow melts promptly replace them with more appropriate photos. Ask for help – Additional sets of eyes can really help. Don’t neglect the outside. Contact us, we can assist you. Really pay attention to what your home looks like when you drive or walk up to it. Stand in front of you house and take the time to look at it. I find it helpful to look at winter photos of homes to get ideas and inspiration. Staging for the winter inside is important. Turn that heat up and get the fire going. Selling your home in the winter is an opportunity to make it stand out. We can help you early in the process. John & Cindy Farrell 978-468-9576.